Samer srl, a leading company in the lift sector of central Italy, is present on the market with a wide range of lifts intended for public customers, private buildings, commercial companies and the industry. Samer works with seriousness and professionalism to ensure its customers the ability to use lifts without risks and in autonomy, in the maximum comfort possible, aware that every customer expects an excellent maintenance service that ensures every day a safe and reliable operation of the lift. 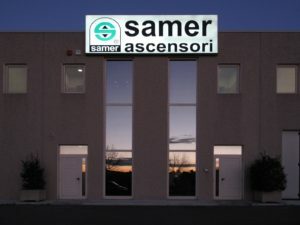 Founded in 1972, today SAMER srl is a reference point in the elevator industry in Umbria and the surrounding regions thanks to long experience, a high knowledge level, a highly qualified and constantly updated staff, and a professional and efficient service of maintenance and installation. Samer was one of the first Italian companies in the sector to invest in the oleo-dynamic, a constructive solution that today alone represents more than 70% of the domestic and European market. In addition to the many years of experience, the company differences by the professionalism of his staff, for the choice of materials, for the precision in the execution of the work, for the high reliability thanks to which it is able to maintain quality and warranty. Another source of pride is also represented by the certifications and attestations received in recent years. The quality of the implants and cost containment have enabled Samer successfully compete with the most established companies in the industry, producing more than 2000 elevators. Thanks to the company quality system certified to ISO 9001, Samer got the qualification for the execution of public works SOA. In addition, from 2014 Samer is the only authorized service centre Stannah for Umbria. In addition to standard products, Samer realizes prestigious installations, customized to the specific needs of customers and characterized by an accurate and innovative design, by the use of high quality materials. In addition, Samer offers its customers a number of additional services that allow them to expand coverage and technical assistance. Samer is a founding member of TRE-E, a consortium that brings together 20 Italian lift companies of the center – north Italy providing strategic services in the field of education, innovation and updating to the associated companies. With TRE-E the company has developed and expanded its activities, has improved the quality and the quantity of services offered, advantaged by the resources made available by the consortium. As part of the TRE-E consortium, Samer adheres to the “Impianto Sicuro” project, which provides a high-quality maintenance service of elevation systems. Moreover, thanks to the compliance of its quality system to the attached XI of the Lifts Directive 2014/33/EU, Samer can test autonomously its own elevators, ensuring a complete service and substantial savings of time and money for its customers.